That, I would say, sums me up. 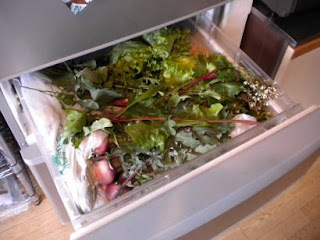 R coined the phrase (yasai is the Japanese word for vegetables, and otaku means geek) when he came home and opened the vegetable drawer of our refrigerator. When we left home this afternoon it was essentially empty, and we were lamenting the fact that since the garden is in transition at the moment there isn't much to harvest. Now, as you can see it's full near to bursting with some kale, beet greens, arugula, and two heads of lettuce from the garden, along with a bag each of spinach and komatsuna from one of the nearby vegetable stands. On top of all of this (literally) is a hefty bundle of kabu in the lower left corner of the closer photograph (white turnips) that have a purple tinge to them. They look too delicious to pass by, right? Nothing better than a drawer filled with luscious vegetables!! That looks so healthy. You are inspiring me to garden. I agree, Anjuli, although we go through it so fast that it's hard to keep filled to the brim like this. I can hardly wait for the garden to start humming along again. Give it a go, Andrea! It's fun and satisfying to eat what you grow. Even if you have room only for a small pot of a favorite herb or edible flower, you'll enjoy it immensely.